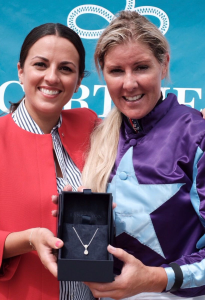 Many congratulations to multiple champion point-to-point jockey and amateur NH champion Gina Andrews on a great victory when partnering CLIFFS OF CAPRI for Jamie Osborne in the Longines Handicap over 7f at Ascot on Saturday where 12 runners went to post. 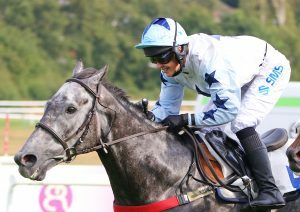 Amateur Lady NH Champion Jockey in 2010/11 as well as runner up in 2008/9, 2014/5 (runner up to sister Bridget) and 2015/16, Gina’s win made her an unusual double on the big stage, her other high profile success being the Fluke Walwyn Kim Muir at Cheltenham Festival 2017 with Domesday Book for Stuart Edmunds. Arguably one of our strongest lady riders, Gina urged her horse 2 furlongs from home to score decisively by 2 lengths from Joanna Mason and NORMANDY BARRIERE with Lisa O’Neill and NICK VEDDER a neck third. Gina Andrews pleased to win the Longines Handicap but she won't be swapping the jumps for the Flat any time soon! 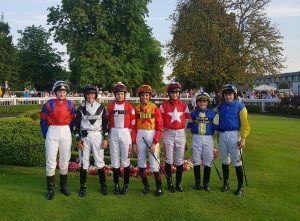 15 runners and riders went to post in the 30C heat in the last race at Worcester tonight for the Amateur Riders Marie Curie long distance hurdle over 2 miles 7 furlongs. 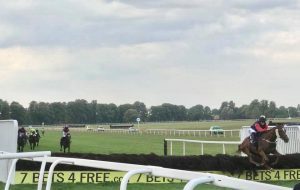 Lilly Pinchin made all on Little Windmill for Neil King and despite jumping the last awkwardly when about 10 lengths clear, nothing could reach the front runner with an eventual winning margin of 7 lengths. 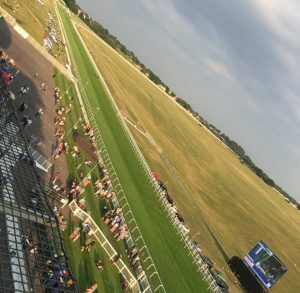 There were 14 runners for the Great Western Wine Handicap at Newbury tonight which opened the card over a mile and a half. 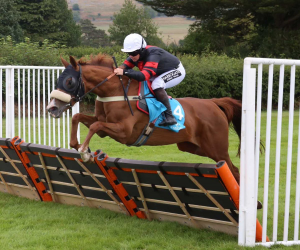 Many congratulations to Becky Smith who enjoyed a well judged front running victory aboard LUV U WHATEVER for Marjorie Fife, following up on their win at Ayr earlier this season. Becky is not only current joint leader of the lady NH championship but now also clear leader of the Ladies Flat Championship too – a unique achievement! Well done Becky! Keep them coming! 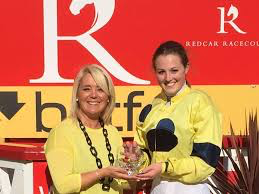 Congratulations Ellie MacKenzie on winning the first last night at Leicester when riding CHAMPAGNE BOB for Richard Price in the Betfair novice riders sprint over 7f. 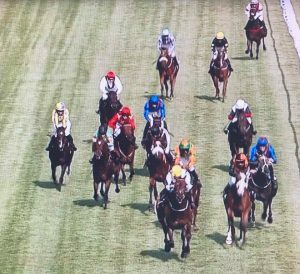 Always travelling well, the winning partnership just managed to hold off the challenge of Alex Fielding and SPACE WAR by a neck, with Joe Williamson and GREAT COLACI 3 1/2 lengths away third. Last year we were delighted to see Carol Bartley enjoy victory in the Silk Series when winning at Newcastle. 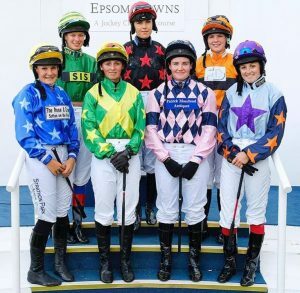 That was the sole amateur win in the series’ inaugural year which was launched by Arena Racing as a new race series specifically for lady jockeys. The first race of 2018 was held on 2nd June at Musselburgh where Cath Walton (2nd) and Joanna Lucy Mason (5th) were the only amateurs riding against 6 professionals. 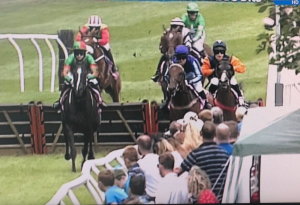 Since then Chepstow on 13th July included Grace McEntee (5th) and Kathy Begley (6th) when 6 ran and Yarmouth on 18th July saw sole amateur Grace McEntee (6th) gain more experience in a 6 runner field. 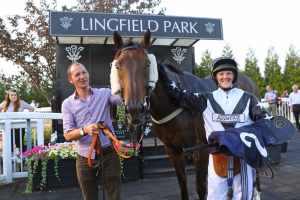 Consequently the series felt rather quiet but everything was about to change at Lingfield! 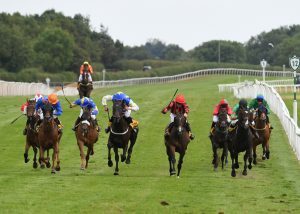 David Drinkwater’s ASHPAN SAM ridden by Ellie MacKenzie made all in this 4f sprint, quickening up to lead two furlongs from home and pushed out by Ellie inside the final furlong to win comfortably by 2 lengths. 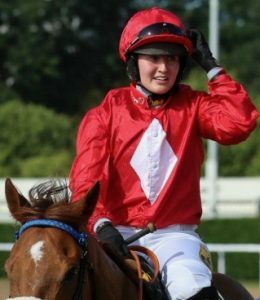 Apprentice Milly Naseb was second on SHAMSHON with amateur Sophie Coll 3rd on OIL DE TIGRE. 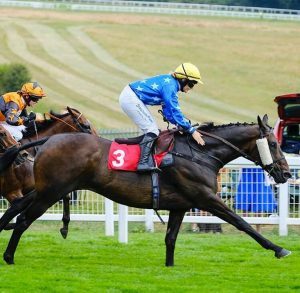 No stranger to the big stage (having enjoyed an Arabian Group win at Newbury last year), congratulations to Ellie on a great ride and well done to winning connections! 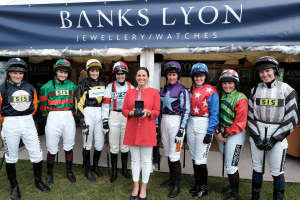 The most valuable ladies hurdle race of the season, the generously sponsored Banks Lyon pro-am, was run at Cartmel on Saturday with 6 lady amateurs participating out of a 9 runner field. 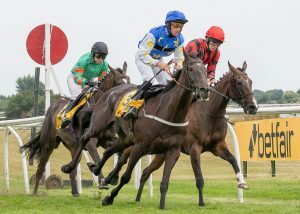 It was a great performance by Peter Bowen’s WELLS DE LUNE ridden by Jodie Hughes who led from pillar to post on the good ground and managed to hold on (despite the best efforts of Alice Stevens) to win by a length and a quarter from Alice on Henry Daly’s INNOCENT TOUCH. 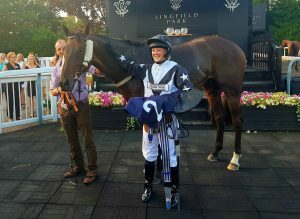 Many congratulations to Jodie and winning connections. 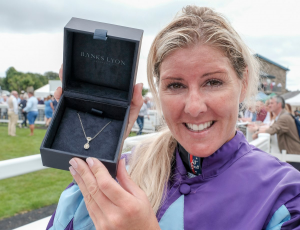 Jodie was presented with an exquisite 18 carat white gold and double drop yellow diamond necklace by kind sponsors Banks Lyon following her victory. Well done Jodie! The final race of the day also saw prominence of another lady amateur enjoying a great season. 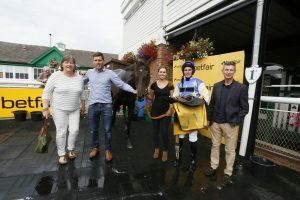 Becky Smith made all aboard trainer Stef Keniry’s HERMANUS in the Hadwins Motor Group Mares Handicap Hurdle to give the mare her first success over obstacles. Becky is enjoying a fine season both on the Flat and over obstacles, now in joint pole position under both codes! Well done Becky! 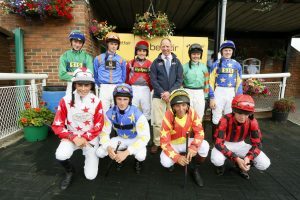 The first of this year’s races in the Betfair Novice Amateur Riders Series took place at Catterick on Wednesday 18th July over a mile and a half under the watchful eye of BHA Jockey Coach Tim Reed and produced one of the best finishes of the day. 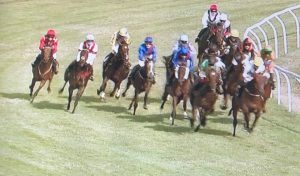 Nine jockeys took part with Billy Garritty and Micky Hammond’s RUSSIAN ROYALE cutting out much of the running. 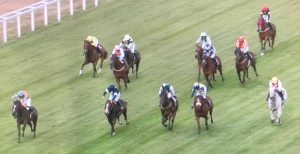 However Dylan Mcdonagh and Lawrence Mullaney’s BUYER BEWARE were never far away and led well inside the final furlong to win by a 1/4 of a length with RUSSIAN ROYALE just holding on for second a head in front of WOTABREEZE and Colin Quinlan. 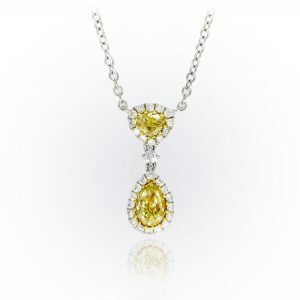 Jessica Gillam was fourth. 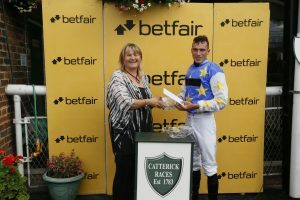 Huge thanks to Catterick Racecourse and Fiona Needham for all of their help and support in hosting this race. The series now moves on to Leicester on Wednesday where it is the biggest field of the day with 13 declared! 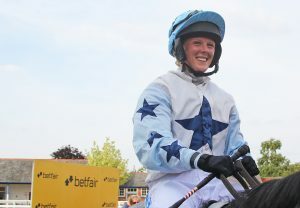 Ellie MacKenzie’s name is already familiar amongst Arabian racing followers, especially after her debut success at Group level at Newbury’s Dubai International Arabian Races (DIAR) meeting last July for the Royal Cavalry of Oman, denying Tadhg O’Shea victory in a driving finish with Olivier Peslier third. 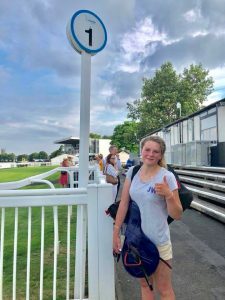 The CNA Hardy Handicap over a mile for lady riders at Sandown on 6th July showed Ellie enjoy her first win this season under Rules and her third overall with Rod Millman’s BIOTIC, holding her horse up until the last 100 yards where he responded gamely to being shaken up and won comfortably. The finale @Sandownpark goes to the smooth-travelling Biotic (3-1) who gives jockey Ellie MacKenzie a third win. The winner trained by @rodmillmanracin. 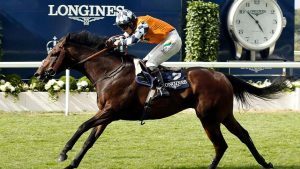 Joanna Mason and Tapis Libre enjoy 4th Epsom Derby success! What a horse! What a ride! 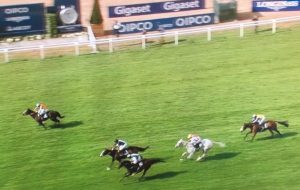 Many congratulations Joanna Mason on a great ride aboard the legendary TAPIS LIBRE who seems to have made the Ladies Derby at Epsom his own! Victorious now in this unique race no less than four times, last night being his third in succession, Joanna began urging her horse along before they turned for home. 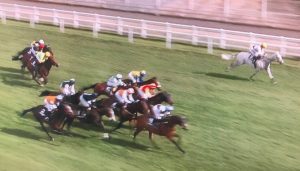 Under strong and patient driving, Tapis Libre steadily closed to stay on strongly and take up the lead inside the last 75 yards. 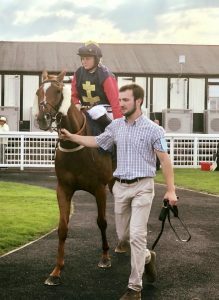 No stranger to adversity herself, having come back from a serious spinal injury following a point-to-point fall in 2015, Joanna’s sister Laura survived hospital blunders and a serious illness last year. Tapis Libre runs in the colours of The Laura Mason Syndicate which was formed to boost Laura’s recovery and it looks like the best medicine! 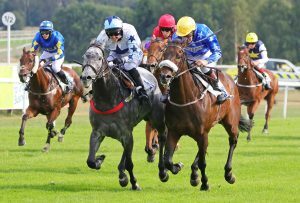 Clearly Joanna has formed a great partnership with Tapis Libre – this was their ninth victory in all so far! 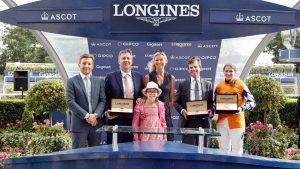 Many congratulations to horse, jockey and cousin trainer Jacqueline Coward. 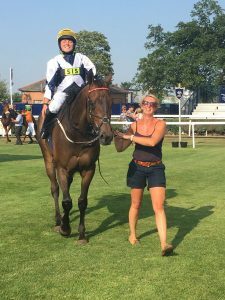 It didn't look likely for a while, but Tapis Libre eventually stays on strongly to win the Focus Rigging Ladies' Derby Handicap (for Lady Amateur Riders) for the fourth time under Joanna Mason! 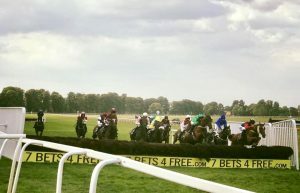 The Amateur Jockeys Association manages the series in consultation with the British Horseracing Authority. 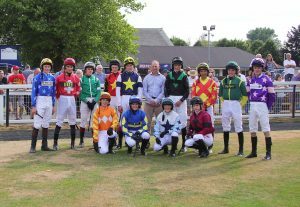 In addition Tim Reed, BHA Jockey Coach, walks the course with all participating jockeys together with a full de-brief afterwards. Points are awarded to riders as follows: 10 points for winner, 6 for second, 4 for third and 2 for fourth. Also-rans awarded 1 point. 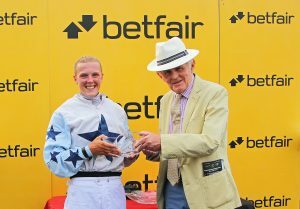 Winning connections are presented with Betfair trophies after each race and the winning series jockey is presented with the Betfair Novice Flat Amateur Series Trophy.